Check out the intro notes from this afternoon’s philosophy discussion. If you missed it, feel free to leave a comment here! Welcome to the Citta Bhavana Ashram everyone! Thank you for joining us today. I’ll give a brief introduction before opening the floor for discussion. Please hold all questions and comments until after the intro. Please consider leaving a donation if you like what you see and want to see more. All donations go towards the sim tier. The donation jar is the candle just beside the fire. It is most often thought that dualism is a Western idea and non-dualism is an Eastern idea. But, even within traditions we find opposing ideas. Let’s explore a bit what dualism and non-dualism are. These are ideas put forth in the philosophy of mind, as well as religion. Very generally, there are two fundamental categories of things. Typically these are the difference between mind and body, and sometimes even mind and brain. In other words, the dualist/nondualist debate is arguing whether or not mind is separate from matter. Now, since we don’t have an agreed upon definition of mind, I’d like us to explore it from the point of view of whatever it means to you – whether it is consciousness, spirit, soul, awareness, divine, whatever. I don’t want us to get caught up in this, since it could mean any of these things or more, and I feel that it’s meaning is a bit of a personal matter. I’d rather we focus on the difference between this and the material world. On a personal level, body can be considered to be the physical experience, including, sight, smell, taste, hearing, and touch. Mind can be considered to be immaterial experience: thoughts, patters, self, ego, memory, awareness. If you think of it like a venn diagram, what comes in the middle? It has been debated, too, that body has memory – some may say “muscle memory” but others also speak about fascia as holding physical memory. Hence why sense objects can be a trigger for memories. However, this is not of as much importance in our discussion today. In Indian philosophy, there are two concepts: purusha (consciousness, spirit) and prakriti (matter, nature). These are considered in nondualist philosophy to be AND – as in, they are inseparable and of the same importance; whereas in dualist philosophy it is purusha versus prakriti – as in, one always struggling for importance. In some dualist traditions they may consider that either purusha or prakriti is more important (depending on the tradition), though most often they say purusha (conscoiusness, spirit) is more important, and in fact more true reality than the material world. We find this same idea all over religion, spirituality, and philosophy. Many dualists do consider that the material world is real – we can all experience it more or less the same. What is in debate is the non-material world, or mind. Descartes, in his “Meditations,” argues for the point of view of mind and God as being one and the same. This is echoed in Eastern traditions through the concept of prana and qi (energy or life force), and even Atman and Brahman (individual consciousness and universal consciousness) – in other words, the part of us that is also in everything else. The most true essence of existence. We know that all material things are subject to change. All things change over time, and this is unavoidable. So many schools of thought would argue that if it changes, it is not real. So that which is unchanging, this purusha (consciousness, divine, etc), is the most true, or the most real. In nondualism, it is recognized that all things are ultimately the same. That nothing is unique, and even our consciousness is not our own. By that, it is meant that we are all drops of the same ocean – that we are all small parts of one big whole. That we are not existing without everything else, and everything else is not existing without us. So, do you think that we have something in us, something perhaps divine or extensive in nature, that exists separate from the material world, or do we have an innate connection to that which surrounds us and can be experienced? Are we unique individuals, or are we really part of one big whole? Can our minds exist without our bodies? Does whatever makes up the “I” exist in our minds, our bodies, or neither? I open the floor. What do you think? Welcome everyone to Sengoku Japan! Thank you for joining us here today. You can get a copy of the notes from the poster behind me, and if you feel so inclined please consider leaving a donation using the flower vase beside that. Today we are going to discuss that which cannot be discussed – the Tao. What this is saying, among various other interpretations, is that all of our experiences, including language, are merely a sign pointing to a non-conceptual ultimate reality. It is important to not focus on these sign posts but to focus instead on the ultimate reality (Tao) to experience it clearly. So what is “Tao”? It’s literally translated to “way,” “path,” or “principle.” It is the underlying ultimate reality to all that is. “It’s about this dumpy little bear that wanders around asking silly questions, making up songs, and going through all kinds of adventures, without ever accumulating any amount of intellectual knowledge or losing his simpleminded sort of happiness. That’s what it’s about,” he said. As this tradition comes from Chinese philosophy which is steeped in the concept of yin and yang, or opposites coming together to form Truth or Reality. They are not necessarily two different things, but rather opposite and complementary qualities of the same basic Reality. Juxtaposed to this is the concept of Yu. These represent being and non-being. There are many philosophers who believe that Wu can be directly experienced by humans in certain forms, though I tend to prefer the idea that both are existent in all things, and one can perhaps not exist without the other. Building from this is the concept of Wu Wei, or “actionless action.” Contrary to popular thought, this does not mean inaction or lack of action, but rather going along with the natural flow of things, acting in spontaneity and not obstructing the natural Tao. This can be a lot to take in. Some people will follow the Tao for their entire lives and not necessarily understand. But, any comprehension is beyond language, study, and even maybe experience. It’s said to be a kind of dropping away into nothingness, while still being fully here. This makes it difficult to discuss, but let’s try anyway. What do you think about this? How does it relate to your own experience of the world? Well, it has been a beautifully long and busy summer, and in all of it I seem to have neglected posting my discussion notes. So, over the next few days you will get a few updates! This first post was not used for intro notes, but rather a guideline to some of the topics we’re discussing at the 5pmSLT Sunday meetings on Sengoku. In the West we typically approach philosophy from finding the space between a set of opposites – for instance mind and matter, or self and other. In the Japanese traditions, rather, they try to find where these philosophies overlap, essentially negating that anything is separate from anything else, but rather everything is a process of apparent opposites. ⁃ Shintoism, a native form of animism that addressed an essence within each of us and in every living thing known as “kami,” which governed the world. ⁃ respect for animals, weather, nature, and ancestors. ⁃ Confucianism and Buddhism imported from Korea and China. ⁃ Buddhism focused on the workings of the inner self. The most common ideas in Buddhism are impermanence, emptiness, dependent co-origination, and the impermanence of the self. ⁃ It was in this period that the miyabi (elegance) and (okashi) charming aesthetic themes emerged. ⁃ The philosophical ideas of impermanence (mujō) and deep ontological being or mystery (yōgen), poignancy (mono no aware) and sensitivity (ushin) were further developed. ⁃ Samurai class takes over the court life seen in the classical period, turning people to search for a religious philosophy which would lead to peaceful everyday life rather than big-picture answers. Buddhist schools such as Pure Land, Zen, and Nichiren were established. ⁃ Thinkers of this time were Hōnen (1133-1212), Shinran (1173-1263), Dōgen (1200–53), and Nichiren (1222–82). ⁃ Hōnen and Shinran each founded a school of Pure Land Buddhism which focuses on faith in Amida Buddha, “the buddha of light who promises rebirth in the Pure Land to the faithful.” (http://www.britannica.com/EBchecked/topic/301242/Japanese-philosophy) They critiqued the idea of self as an isolated ego. ⁃ Dōgen was a main figure in Zen Buddhism, known for his ideas of the self and consciousness, with a focus on zazen, a particular form of seated meditation. Zazen was developed not as a means to enlightenment but as a form of discipline as an end in itself. ⁃ Nichiren focused on the Lotus Sutra and its ideal of the bodhisattva. ⁃ The native Shintō ideas and practices were absorbed into the Buddhist traditions during this period. ⁃ Confucian ideas reemerged to encourage peace and stability, unifying the state to political centrality. ⁃ First are those who emerged from the neo-Confucian philosophies of Zhu Xi (Shushi; 1130-1200), Wang Yangming (Ōyōmei; 1472-1529), Hayashi Razan (1583-1657) and Nakae Tōju (1608-48). This group had some members who thought that the neo-Confucian philosophy was too abstract when detailing ri (metaphysical principle) was the structuring force of the universe – they emphasized that qi (vital force) was the main structuring force of the universe. ⁃ The next group was the school focused on the “traditional” ideas of Confucianism as presented by Confucius, which emphasized a less metaphysical view and was more concerned with the functioning of everyday lives than answering the greater picture. This school is known as the kogaku school. ⁃ During this period, a school of thought known as kokugaku emerged which held the idea of returning to the original “ancient ways” of Shintōism. They wanted to renew the ideas of mono no aware – a sensitivity to or sympathy for the things that constitute the world. ⁃ A new word was coined during this period that was meant to be a direct translation of the English term “philosophy” – testugaku, comprised of wisdom (tetsu) and learning (gaku). ⁃ Here is when the Western constructs started to influence Japanese philosophers. The first major Japanese philosopher to use the Western style of philosophy was Nishida Kitarō (1870-1945) in his “An Inquiry into the Good” (1911). He introduced a philosophy he called “Nothingness” (mu), which fuzed the ideas of Zen and William James to come to an idea of “pure experience” based on experiential and logical experiences of judgement and action. His ideas inspired the Kyōto school of philosophy which explored the differences and similarities of Western and Eastern philosophical and religious traditions. ⁃ Nishitani Keiji (1900-1990) explored the idea of Nothingness and brought the ideas of Martin Heidegger (who he studied under), which was already arguably similar to Japanese ideas of being and existence. ⁃ Watsuji Tetsurō (1889-1960) disagreed with the ideas of Western individualism as well as Confucian collectivism, and instead posited an ethical idea of “betweenness,” as if each individual exists on a sliding scale of “individual freedom and socially imposed norms.” (http://www.britannica.com/EBchecked/topic/301242/Japanese-philosophy). ⁃ Tanabe Hajime (1885-1962) also found a sliding scale between the universal and particular ideas, feeling that the schools of either ignore the fact of specific species. For instance, the respective schools would emphasize a person’s universal human nature or atomistic individuality. What Tanabe introduced was the idea of a person as an ethnic, national and cultural being, having an individual role as well as a universal role. ⁃ Some modern philosophers that have stuck to the traditional philosophies are Tamaki Kōshirō (1915-1999) and Nakamura Hajime (1911-1999) who follow a Buddhist tradition. Some others, such as Yuasa Yasuo (1925-2005) and Ueda Shizuteru (1926-current) focus on integrating ideas to establish a universal or global perspective rather than monocultural. You can now find me in InWorldz as Chraeloos Aristotelous, and in my group “The Art of Bowing”. Amidst many changes in my life I am called to write. There is a certain kind of feeling experienced when you leave everything behind for a completely new path. It’s a feeling like floating on a wave – not quite awake, not quite asleep, dreaming, not waking. Every moment is full of endless potential. But, then again, isn’t it anyway? It is in these times of transition that we find ourselves – our real, true, unbiased, no-illusions, self. We tend to find that the Self is completely unlimited. That, in fact, there isn’t a Self, definable as such, but a series of comings-and-goings. A kind of desperate plea for uncertainty. At first, it feels liberating. You have no responsibilities, nothing in your name, no job to get to, no school, or family, or friends calling for your attention. Everything is just space. Everything is limitless. Driving over the mountains, clearly endless blue skies above us, we felt as though we were on top of the world. We had 14 hours of homelessness, in one of the most beautiful parts of this country. The air is so much fresher all these miles above the busy cities and refineries. It’s almost too easy to forget all of this modern world. Forgetting is what our minds want to do. It is the easy way out of responsibility. Caring is difficult. Caring takes time and attention and energy, none of which are easily replenished as every action takes time to see the result. Caring can be overwhelming. Up here, on top of the world, there is nothing to care about. It is here where I experience true release, true happiness. You see children smiling for no reason at all, smiling at the smell of the flowers and the songs of the birds and the feel of the air against their skin. It is up here that I can truly say I understand what they are smiling for. The sun feels so close and so warm, and time slows down. It has been one full week since we experienced that. It didn’t take long for the 14 hours to pass and for us to take the seemingly short descent into the valley that we now call home. You see the city before you see the ocean, all lights and busy people. It is like waking from an existential dream of non-duality. The experience is much like taking that first step out of a retreat hall and onto a busy street. It’s a bit overwhelming, but you’re lucky, because you have all this stored up happy energy from the experience of release. This stored-up energy allows you to see the new landscape with fresh eyes, non-judging and compassionate. You make it through the busy city, as your new home lies on the far side, only blocks away from the vast, free ocean. You get here unscathed, still holding that happy, light energy close to your heart. This energy had permeated your whole body, and it lifted you to a lightness that was like you had become a cloud. The flowing and pulsing dance of wind and life-energy still coursed through you, with you, as you. As you enter your new home and proceed with all the formalities, you take a deep breath, and feel suddenly dizzy with realization. The search you have been on for your whole life, this search to be happy and free like you feel on top of the mountains, you feel it now too. It hasn’t left. The only thing that changed is your perception. Rather than seeing it for what it is, always present, you see it as something only attainable in certain environments. You close your eyes, letting your other senses experience the moment, and you feel this dreamlike happiness. Opening your eyes, it’s still there. You take a step, and still, it’s with you. A smile spreads on your soft lips and your eyes brim with tears. Regardless of what life calls on you for, you are there, completely present, and it is okay. Everything is okay. Everything is okay because inherently, you are free. You are expansive and huge, infinite. You are potential. Everything is potential. 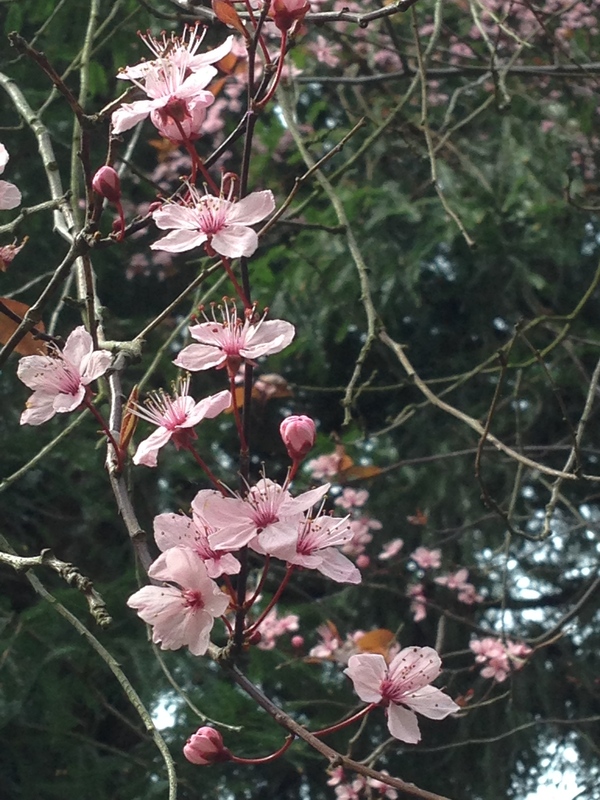 Cherry blossoms line the streets, mingling with flowers you don’t recognize. You can pick up probably a dozen different bird songs. You tell yourself that the steady thrum and vibration is the sound of the nearby ocean, though you’re probably kidding yourself. The tides pull at you as the pulse closer and further, grasping and releasing. Even the concrete buildings squished into city-blocks pulse and vibrate with life. Everything exists in meditation. Everything meditates. Abandoning your few possessions, the first stop is the bay, the soft sand squishing between your toes, the smell of salt-water and fish a welcome reminder that you are home, and you are safe. First, please watch the video below. It’s 12:46 so you can do this in a short time. Does everything exist as non-dual? Everything has a mere appearance, but does any of it have essence? Nothing has individual essence, therefore everything is non-dual as we perceive it as mere appearance of essence, when it is in fact empty. Geshe-la mentions form as body, but form is everything. Body is made up of mountains and rivers, goats and birds, air and fire. Form is everything we perceive in a dual nature, which is really non-dual. Form is ever changing, flowing, shifting, walking like mountains walk. Stillness and emptiness are non-dual. Stillness is perceived, when really nothing is ever still. Even in physics we see that atoms are constantly vibrating, gravity is working on our atoms making them move around each other like planets and suns. Stillness exists only in the present moment, only to our perception, but really, form is empty of stillness. Form is empty of form. If the world exists as non-dual, why do we perceive it as dual? Our attachment to ignorance and self-grasping. By recognizing the non-dual nature of things we can be released from attachment, grasping, avidya. A quote came to mind: “When the wave forgets that it is the ocean, that forgetting process is Avidya.” We are each waves in the vast ocean of non-dual existence, and we have forgotten that we are part of the ocean.